Posted on May 15, 2006. Coutts & Co (bank to the queen, and part of the Royal Bank of Scotland Group) offers a credit card to it’s private clients that itself is rarer than the black card. There are only about 100 people in the world that have been invited, including Queen Elizabeth II. The World Card is only offered to Coutts clients, and it’s members prospective clients have millions in assets. The bank to the queen, now a part of Royal Bank of Scotland Group, has arguably the most prestigious card of all. World Card is offered only to Coutts clients, and you have to have millions to qualify for that status to begin with. Aside from all the typical travel upgrades and luxury services, the card comes in handy when you need to go shopping at your favorite department store in the middle of the night. A quick call to a World Card service representative will arrange a private after-hours shopping session anywhere your little heart desires. I have this card. The description say’s it all. It opens doors! I also have a Black Amex. Though for me, The Coutts World card is the only card. you have a coutt’s card but do not know how to spell ‘say’s’? that is shameful, don’t you think? This is a credit card – get over it. I have a Coutts world card but don’t consider it or myself more special than anyone else. It doesn’t open doors because honestly no-one cares, neither do Amex Black cards. I own restaurants in London and see these cards all the time belonging to ordinary and not so ordinary people. Just because someone might have a lot of money it doesn’t mean they are necessarily about to spend it with you, or that based on that fact alone they require instant respect. I have not understood why people report being automatically upgraded at 5* hotels for FREE! If you book, say, a junior suite at around £180/night and you are upgraded to an executive one bedroom suite – what is in it for the hotel? Certainly I understand high-value cards opening doors and putting smiles on the faces of mangers in luxury good stores; but opening doors and smiling doesn’t cost anything and might pull in some lucrative business. locked door and a scowl are not encouraging. At the end of the day money is money and business is business; these cards merely indicate that you have got it to spend. It is not a credit card. It is a charge card , meaning that the balance must be paid in full every month. I have the American Express Centurion card, The Coutts & Co. World Card (which is not exclusively for British citizens, as I live in the US), as well as a Visa Infinite card, a Stratus Rewards Visa and the American Express Platinum Card. Well, I have to say… These cards have all done their job for me… I have arranged lots of after hour shopping appointments at Neimans and Saks Fifth, however, The Coutts & Co. Card is just another credit card… and many of the sales associates don’t even know what it is, or don’t even care. If you are shopping for a luxury credit card, the essential and most recognizable card that you must have is the American Express Centurion Card. Why would you have two Amex accounts to simultaneously run two Amex cards when the centurion would make the platinum obsolete anyway? Coutts isn’t just “another credit card” in the UK, it is the most exclusive and respected BANK in the world. Bearing in mind 90% of American’s probably don’t even know where the UK is on a map it’s hardly unsurprising that people in shops over there only recognise the Amex because Puff Daddy flashes his around on MTV. I had the Platinum, then the Centurion, the charge here is ridiculous nearly $3000 and they failed on every single occasion to source any of my requests, i left Amex 3 years ago, because, in reality, they are toss. And just a final note to your post, the Centurion is a charge card not a credit card. Typical Brit with no class. Loan Lease was a serious mistake. Interesting and absolutely incredible to see that 3 out of the 100 owners of the Coutts card are actually such tossers that they have to go to this website to brag about it, one of them even doesn´t know how to spell. Bragging about money is for poor people, like puff daddy indeed. Or they’re just lying basa? The Coutts & Co.’s World Card is also a charge card by the way. Not a credit card or a debit card. Anyone with a few million in the bank will have at least a minor understanding of such things, so is unlikely to make such an error. Unless of course they are some uneducated footballer or music star who has their money 100% managed by people they think they control, but probably don’t. 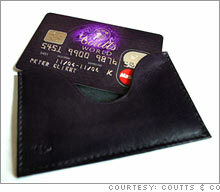 Source: I have a Coutts account and a Coutts Classic Card (Which is a credit card), through my business. I don’t have a Coutt’s World Card, as sadly I don’t fullfil the requirements. Whether or not any of these guys have the cards mentioned doesn’t really matter to any of us? Really, I think it is great that they have them and congratulations to them for it. Picking apart the spelling? If you have money and credit, it doesn’t mean you are also educated….just successful…That is the American way, right? The guy who grew up on a farm, didn’t go to school but now owns have of the Midwest! Stop hating, you may find yourself in a better place! This is ludicrous chat. My old man has bare Coutts cards, including Coutts Classic card and Gold card. Gutted ‘TonkaToy’ that you didnt meet the requirements….not enough dough blud? All this dolla talk is doing my nut in, to be honest its all about how many pinkys in the wallet, not all these cards n ting.. I am a private banker at Coutts; and I can issue you with a Coutts World Card for a one off fee payable in cash of £15,000. Why would anyone pay you £15,000 cash for a Coutts World Card?!?! ?